With Week 3 behind us, and some more fresh stats to analyze, I’m here to help you with your toughest fantasy football start/sit decisions for Week 4. Evan Engram is out this week and Odell Beckham Jr. will have a tough matchup in shadow coverage against CB Marshon Lattimore – our eighth-highest-graded cornerback in 2017. This should funnel targets to Shepard in a dream matchup against CBs Ken Crawley and P.J. Williams (Patrick Robinson is on IR). Crawley and Williams have been targeted a combined 26 times through three weeks, surrendering 21 receptions, 431 yards, and six touchdowns. By any measure (total fantasy points, fantasy points per target) this is the worst duo on any team in the NFL. As outlined here, Landry’s volume has been incredible this year, and should be getting better (as should efficiency) with Baker Mayfield now announced as the starting quarterback. Landry is an easy WR1 for me this week, against an Oakland Raiders defense that has surrendered the third-most fantasy points per game to opposing slot wide receivers (where Landry runs 74 percent of his routes). Fuller has played in six games with Deshaun Watson active. In those games, he averages 21.7 fantasy points per game. For perspective, that would have ranked second-best among all wide receivers last year. In order, he’s had per-game outputs of 19.9, 20.2, 14.2, 29.5, 25.3, and 21.1, and has outscored DeAndre Hopkins in three of these last four games. With volume better of late (20 targets through two games), regression is less of a concern, and he should be started as a high-end WR2 in all formats. Last season, Joe Mixon played on just six snaps in Weeks 14-16. In those three games, Bernard averaged 16.0 carries per game, 5.7 targets per game, and 20.7 fantasy points per game, while playing on 86 percent of the team’s snaps. Last week, with Mixon out, Bernard saw 12 carries, nine targets, and totaled 19.6 fantasy points. He played on 81 percent of the team’s snaps and saw 100 percent of the team’s running back touches. Bernard is a better pass-catcher than he is a runner, and that should come in handy against an Atlanta Falcons defense that has surrendered the most receptions to enemy running backs in each of the past four seasons. Although Jacksonville has been taking things slow with Fournette’s injury, he’s an easy start if he suits up this week, and especially if T.J. Yeldon (currently questionable) is out. The Jaguars are 7.5-point favorites at home and against the Jets who have surrendered the 10th-most rushing fantasy points to opposing running backs this year. Additionally, you should expect Fournette’s usage to be even better this year than last. Though Tate leads Detroit’s wide receivers in targets with 30 — ahead of Kenny Golladay’s 27 and Marvin Jones’ 22 — he’s easily the riskiest start this week. After three straight soft matchups, he now faces off against a Dallas defense that is surrendering only 3.5 fantasy points per game to opposing slot wide receivers. Not only is that best in the league, it’s best by a mile, with the league average rate sitting at 13.8 fantasy points per game allowed. Fitzgerald has seen just seven targets and totaled just 37 yards over the past two weeks. It’s clear he’s playing at less than 100 percent. On what’s probably the worst offense in the NFL, that doesn’t leave much room for upside. The matchup is tough as well, up against a Seattle defense that ranks top-12 in fantasy points allowed to slot wide receivers. He’s just a low-end WR3 this week. Allen has four touchdowns to his name but is averaging just 2.0 yards per carry and 34.0 yards per game. With Alex Collins performing much better and seeing an uptick in usage every week thus far, I suspect Allen is too risky to start this week. The matchup is tough too, with Pittsburgh ranking fourth-best in fantasy points allowed to opposing running backs. Cole leads Jacksonville’s wide receivers in targets (19) but only by three more than Donte Moncrief and five more than Dede Westbrook. This is a matchup far better suited for Westbrook in the slot (85 percent of his routes) than Cole outside (72 percent of his routes). The Jets are allowing the fourth-fewest fantasy points per game to outside wide receivers but the second-most to wide receivers out of the slot. Lynch has a touchdown in all three games this year (all losses), with touch totals of 13, 20, and 22 (in order). As 3.0-point favorites this week, if Vegas’ prediction stands, this could be Lynch’s biggest game yet. The matchup doesn’t hurt either, with Cleveland surrendering the third-most rushing fantasy points per game to opposing running backs. Over the past two weeks, Boyd ranks seventh among wide receivers in fantasy points and 28th in expected fantasy points. He’s run 82 percent of his routes from the slot this year, and Atlanta’s nickel cornerback Brian Poole ranks sixth-worst of 52 qualifying cornerbacks in fantasy points allowed per route in coverage. (Atlanta also surrendered the fourth-most fantasy points per game to opposing slot wide receivers last year.) I’ll be starting Boyd as a low-end WR3 this week and will be prepared to move him up even further depending on A.J. Green’s status. Carson finally took control of the Seattle backfield in Week 3. He played on 74 percent of the snaps, saw 32 of 35 carries (for 102 yards and a score), and saw two of the team’s three running back targets (for 22 yards). Given his success, relative to Rashaad Penny’s lowly 2.2 yards-per-carry average, I suspect this sort of usage will continue in Week 4. The matchup is strong as well. Seattle is favored by 3.0 points and Arizona has surrendered the most rushing fantasy points per game to opposing running backs this year. Last week, with Jack Doyle out, Ebron saw 11 targets, including four red-zone, three end-zone, and one deep target. Although the production wasn’t there, the volume surely was. If Doyle is out again, I’d start Ebron as a mid-range TE1 against the Texans. In general, Lewis trumps Derrick Henry in volume with 11.6 expected fantasy points per game to Henry’s 8.2, but Lewis wallops him when in negative gamescript. When trailing, Lewis totals 15 carries and eight targets to Henry’s five carries and zero targets. After two surprise victories, Tennessee is being spotted 4.0 points against the defending Super Bowl Champions. This matchup, from a personnel standpoint, tilts more toward Lewis’ favor as well. The Eagles are surrendering the fewest rushing yards to opposing running backs, after surrendering the fewest in 2017 as well, but they’re a good deal more susceptible to running backs through the air. For the same reasons I like Lewis as a sneaky start in medium-sized leagues, I’m benching Henry against what’s probably the best run defense in the NFL. Hogan has seen just 12 targets and ranks third-worst of 43 qualifying wide receivers in targets per route run. Something looks off with New England’s offense and Tom Brady, who is only our 14th-highest-graded quarterback this year. Meanwhile, Miami quietly leads the league in opposing passer rating (65.6), while also leading in interceptions (seven) and touchdowns surrendered (two). Tampa Bay ranks first in total yards and third in total points, and yet, somehow, Barber ranks only 52nd among running backs in fantasy points. A positive regression may soon be coming, but not against a Chicago Bears defense that has surrendered the fewest fantasy points per game to enemy running backs and ranks best in yards per carry allowed (2.87). Goodwin played on only 61 percent of the team’s snaps last week, is still only practicing in a limited capacity, and averaged only 11.0 fantasy points per game with C.J. Beathard under center last year (as opposed to 15.1 with Jimmy Garoppolo). Matt Breida is our fourth-highest-graded running back this year, while Morris ranks 34th. In spite of that, Morris out-touches Breida 42 to 41. Breida has been more effective, however, leading in fantasy points by 21. I suspect this is the week Breida finally blows past Morris in terms of usage. New starting QB C.J. Beathard has an affinity for targeting running backs (to say the least) and we know that won’t be Morris (who has seen only two targets to Breida’s nine). The Jets are 7.5-point underdogs to the Jaguars, which implies better gamescript for Bilal Powell – the superior pass-catcher. However, Crowell doesn’t seem as gamescript-sensitive as you might have thought. When trailing by 10 or more points, the Jets have handed Crowell eight carries and two targets, while Powell has seen two carries and four targets. Factor in Crowell’s dominance near the end zone – he has seen four opportunities inside the 10-yard line to Powell’s zero – and I have Crowell above Powell in my rankings this week. Overall, he’s still a risky start, but good enough for high-end RB3 status. If desperate for a spot-start at the wide receiver position, I’m quite fond of Gabriel. Over the past two weeks, he ranks 18th at the position in expected fantasy points per game. He’s seen target volume climb each week (five to seven to 10) and has an especially soft matchup this week. Rookie WR Anthony Miller leads the team in slot routes but is doubtful this week with a dislocated shoulder. Gabriel leads the team in slot targets with nine. Tampa Bay has given up 28.8 fantasy points per game to opposing slot wide receivers, which is 25 percent more than the next-closest defense. Enunwa has led the Jets in targets for three straight weeks. He ranks fourth among all wide receivers in routes per target and ninth in target market share. Although the Jaguars are a fearsome defense, Enunwa’s individual matchup isn’t terribly prohibitive. Enunwa has run 72 percent of his routes from the slot and Jacksonville is one of only seven teams to surrender more fantasy points to slot wide receivers than outside wide receivers this year. If Alshon Jeffery is out again for Week 4, I like Goedert’s chances of posting another decent game. He ran 27 routes last week – the same number as David Njoku and Rob Gronkowski. He saw seven targets – only four tight ends saw more. He’d be a high-end TE2 if Jeffery is out again. 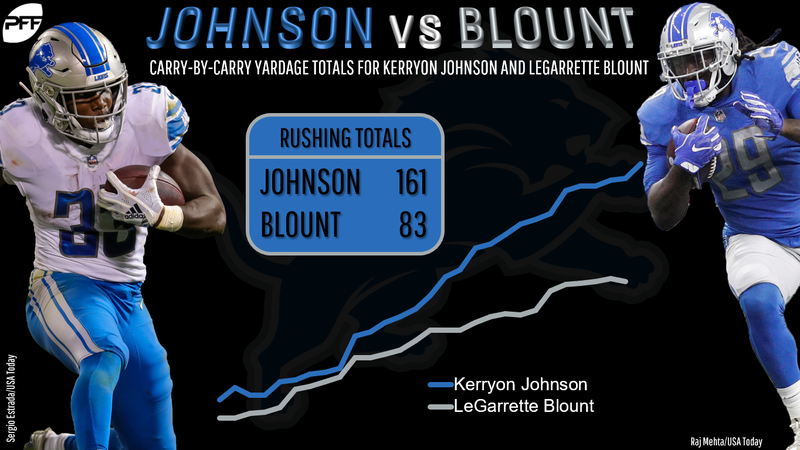 On only one more carry, Johnson totals 78 more rushing yards than LeGarrette Blount. After his 101-yard outing last week, I think this is finally the week he takes control of this backfield. The matchup is also softer now with LB Sean Lee out for the Cowboys. Last year, Dallas surrendered just 3.52 yards per carry with Sean Lee was on the field. When he wasn’t, they surrendered 4.88 yards per carry. Kittle averaged a lowly 4.7 fantasy points per game with C.J. Beathard under center last year. To make matters worse, he draws a brutal matchup against the Chargers this week. Los Angeles ranked best in schedule adjusted fantasy points per game to tight ends last year and they’ve surrendered the second-fewest this year, including holding Travis Kelce to just six yards in Week 1. Last week, with RB Aaron Jones back in the lineup, Williams touched the ball only seven times. Last year Jones averaged 5.5 yards per carry to Williams’ 3.6. Last week, Jones saw one more carry than Williams (six to five) and totaled 13 more rushing yards. Jones and Ty Montgomery combine to force six missed tackles on 17 carries this year. Williams has forced zero on 36 carries. I suspect Williams’ usage will continue to trend down and deservingly so. He’s not a “start” this week, despite the soft matchup. McDonald led the position in scoring in Week 3 but didn’t see tremendous volume, ranking just 23rd in expected fantasy points (6.3), 20th in routes run (26), and 19th in targets (4). He’s just a mid-range TE2 this week. Miami has four wide receivers who average between 3.6 and 4.3 targets per game. Parker, in his first game back last week, saw three targets while playing on 75 percent of the snaps. This seems like a frustrating low-upside spread-the-ball-around offense. It’s hard to get excited about Parker and especially this week, considering we’re projecting shadow coverage from Stephon Gilmore, our No. 17-graded cornerback this year.